Round One in Iruma is a great place for kids to be active on a rainy day. 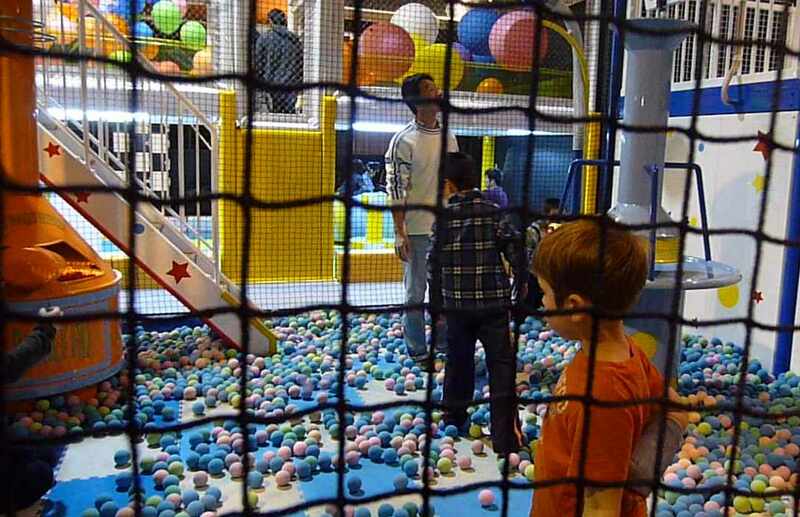 Located near Costco, just off Route 16, it is an easy drive and offers a variety of indoor fun for all ages. For younger kids there is a large, shoes-off play area with a two-story twisty slide, ball shooters, tricycle track, balloon area and it is flanked by free massage chairs. 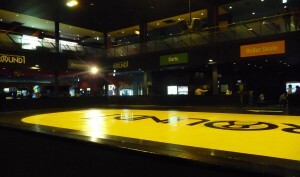 In the same large space there is also a skating rink, ping pong, billiards, mini bowling, darts and video games. While the entrance fee is a bit pricey, it is all inclusive – no extra tokens to buy for video games and roller skates are free. The only extra money you may spend is on food. There is a small restaurant with American style cuisine including pizza. Open 10am M-F, 9am Sat, 8am Sundays and holidays. Prices: I went with two pre-school aged kids on a holiday and paid a total of ¥3500 for 3 hours. Prices are cheaper during the week. 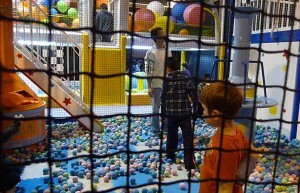 There is a weekday family rate that comes to ¥600 per person (adults and kids alike) for 3 hours of play. To get to the play area, enter the building, go up one escalator and then take the elevator to the 5th floor. This is where you’ll check in and pay at the end. GPS: 35.828026, 139.375817. DIRECTIONS: Exit the passenger terminal gate and turn right onto Route 16. Drive 10 km along Route 16, passing Costco. About 1 km past Costco turn left onto Route 299. Round 1 is located 1/2 kilometer down Route 299 on the right. It is easy to spot from the road once you turn onto Route 299. Once you pass Round 1 on your right you’ll need to turn around to head back to the parking lot entrance. No u-turn at the light, but the Mini Stop parking lot can make a good place to turn around. – Sarah Straus, Kelly O’Donnell, January 2013. The outlet mall right next door to Costco contains name brand stores such as Coach, Columbia, Naturalizer, Reebok, Levis, Adidas, Diesel, and Banana Republic, etc. Forest Kitchen is the second story food court, while Forest Lounge on the ground floor has a Harrods tea and coffee outlet with a green tea counter across the aisle. Costco members may park free in the top of the Iruma Costco building but entrance to the rooftop parking is only via a left-turn entry from Route 16 if you’re coming from the Kawagoe direction, so it’s awkward when you’re coming from Yokota. Instead, drive through the Outlet Park, out the rear then left toward and onto Route 16 (back toward Yokota and Hachioji). If asked, tell the parking attendants “Costco,” and they will wave you toward the rear exit. Once back on Rt. 16 going in the opposite direction, you will be waved to the entrance on the left. Costco parking hours are 9:30am-9pm while the store hours are 10am-8pm. There are several places close to base to obtain outdoor and camping equipment, including Kojitu Outdoors store located on Ome Kaido Road, just north of base. Saizeriya is a clean family style sort of Italian restaurant with picture menus. It offers pizzas (small ¥380+), pastas (¥450+), risottos (¥480+), large salads (¥380+), and desserts (¥290+). This chain marks its locations with a green sign. DIRECTIONS: Shin-Ome Kaido Location: You can approach the Saizeriya on Shin-Ome Kaido from either the Terminal Gate or the East Gate. From the Terminal Gate, turn right (north) and go through the tunnel. Turn right at the 4th light after the tunnel (onto Ome-Kaido Road –truck stop on right, McDonalds on left.) Saizeriya will be on your left after the Dennys, before the McDonalds. From the East Gate, turn left out the gate. Bear left at the second light (“Y” intersection.) When the road ends, turn left. Turn right at the third light (just past the baby clothes store with bunny on sign.) Take this road to Shin-Ome Kaido Avenue (Musashimuraya mako Kita intersection, there is a McDonalds on the left side of the road.) and turn right. Saizeriya will be a short way down on the right, before you get to Dennys. Hours? Phone? Jena Flowers, Teresa Negley. Directions updated: Brian Marriott, 2002. While there are many CoCo Curry Houses in the area (including a small one at the Fussa station), the Mizuho branch out the East Gate may be the closest with parking. At any CoCo, you have several choices to make, starting from a basic curry dish for ¥400, including the spiciness of your curry (mild 1 is ¥20, spicier is more expensive), whether you prefer rice (naan is also available), whether you want meat (chicken cutlet ¥250), if you want a salad, etc. Most of the picture menus also have English too. Once you know what you want, push the bell to order. About fifteen minutes away, there is a wonderfully modern museum in a landscaped setting. The museum is divided into several parts. In one gallery, art by local artists is displayed, including fifty-foot long painted murals to smaller oil paintings. Upstairs, a smaller Children’s Science Room is arranged with hands-on models including the effects of visual illusion through mirrors and a gyroscopic experience using bicycle wheels. Next door, a life-size exhibit of local plant and animal life reflects the natural setting of Iruma as it changes from dawn through twilight and night. The history of the area is shown through displays of local archaeological finds, feudal periods, the clothes of local townsmen, silk production models, etc. A ramp leads to exhibits on tea, a most important product of Iruma. Life-size models of family rooms in China and Tibet show the differences in lifestyles and how tea is preserved and used in different cultures. Glass display cases enclose teapots and English teacups ranging from those with large saucers to smaller porcelain items. A full-size replica demonstrates the simple designs of a traditional teahouse with thatched roof (the low doorways and narrow rooms inhibited the drawing of swords in a feudal society of five hundred years of war). Films on tea and other subjects can be viewed in a museum theater. Teacups and local merchandise can be purchased in the museum gift shop and a restaurant is also on the grounds. Although English-language explanations are not present on all displays, an English brochure includes introductions on the permanent exhibits, building layout, and museum grounds. Cost: ¥200/Adults, ¥100/high school/university students, ¥50/junior high/elementary students. Tokorozawa, a 45-minute drive north of Yokota, is a nice place to spend a day shopping and eating. In addition to the three very nice, large department stores (Daiei, Marui, and Waltz), there are also many small shops. There is a Wendy’s, a Shakey’s Pizza, and many Japanese eateries and bakeries. These are all within a short walking distance of each other. In Daiei you will also find a large variety of restaurants. On the top floor there are many restaurants and on the bottom floor you will find buffet restaurants. If you begin your shopping experiences at Daiei, you can walk across the street to McDonalds and take a left. You will be on a narrow street with no cars, and lots of shops. Here you will find Shakeys and one of two McDonalds. There are CD shops, flower shops, vegetable markets, video stores, electronics, pachinko and more. Then you will come out and go past the station and continue on up the main street to Waltz and many other small shops and accessory stores. Cross the street again and head back to Daiei. The name of the street is “Purope.” One of the best bakeries for fresh bread, called “Sun Merry,” is there. You can park at any of the three department stores as early as 9 am. Parking is free for two hours if you make a purchase of at least ¥2000. After the first two hours, you will be charged ¥100 per thirty minutes. DIRECTIONS: Turn left out the East Gate. At the first light turn right. Stay on this road until it dead-ends, and then turn left. Continue on this road until you reach Shin Ome Kaido. (You will go through two traffic lights and pass the big Yamada discount store on the left.) At Shin Ome Kaido there will be a Mos Burger on the left and a used car dealer on the right. This is your landmark for the return trip. Turn right onto this road. Continue on this road for about 9km. After you go over a long overpass, get into the left lane. Turn left on Fuchu Kaido (the intersection is very large). Stay on Fuchu Kaido for about 2.5km. Keep to the right at the fork in the road, which has a gas station in the center of it. Turn left onto Tokorozawa Kaido. In a few minutes you will see the large department stores and the train station. Continue straight to park in the parking garages.